John has appeared in more than two dozen TV documentaries for the Discovery Channel, Learning Channel, History Channel, National Geographic, and PBS, among others. 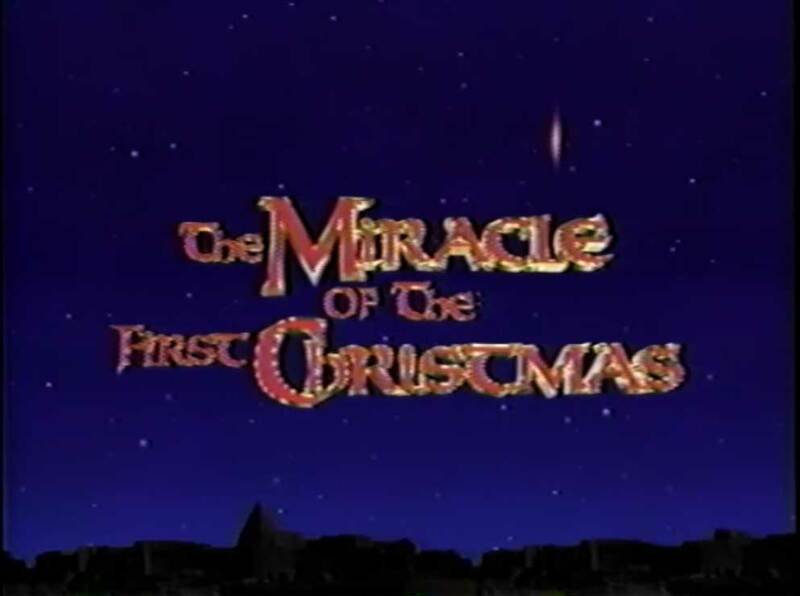 Among the programs are: The Birth of Christ (Discovery Channel, 1991) and The Christmas Star (York Films/Learning Channel, 1993), The Science of Christmas (1999), Miracle of the First Christmas (2000), In Search of Christmas (2001), asteroid collisions for National Geographic (2005), etc. 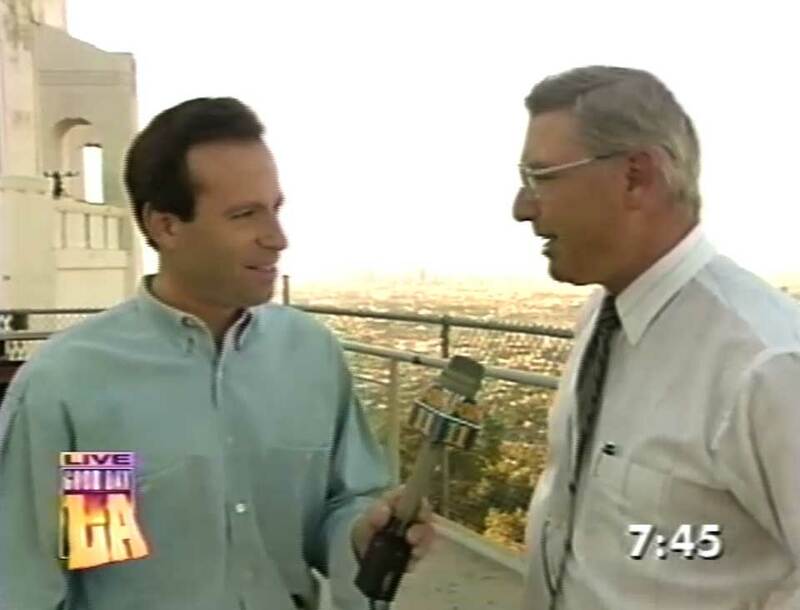 He has also appeared in well over 100 radio and television interviews including: CNN Headline News, Tom Snyder Show, Good Morning America, AM Los Angeles, Dan Rather Evening News, Today Show, Jim Lehrer News Hour, Visiting with Huell Howser, etc. Here are samples from these appearances in no particular order. Click where indicated to view short video extracts as mp4 files. 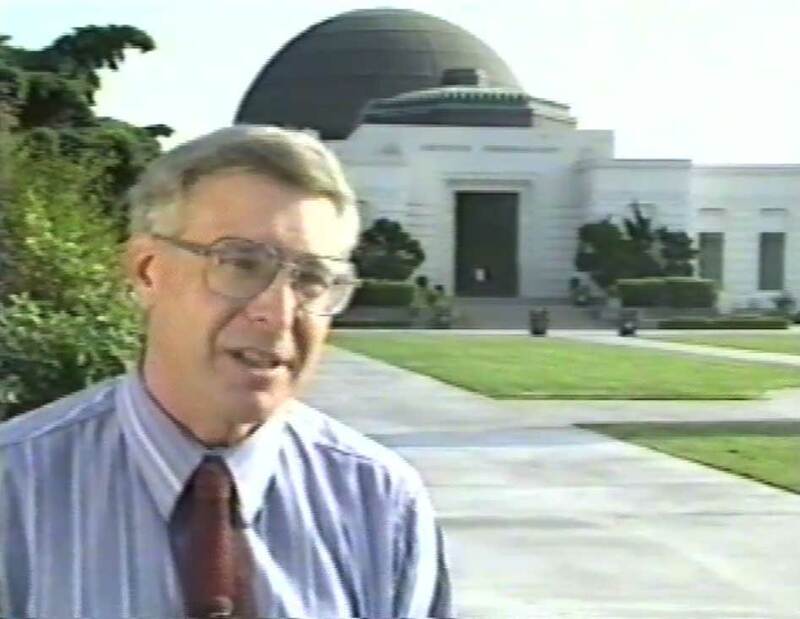 John was regularly called on to explain how to find a new comet or the circumstances of an upcoming eclipse -- or even just the change of seasons -- during his nearly three decades at the Griffith Observatory in Los Angeles. 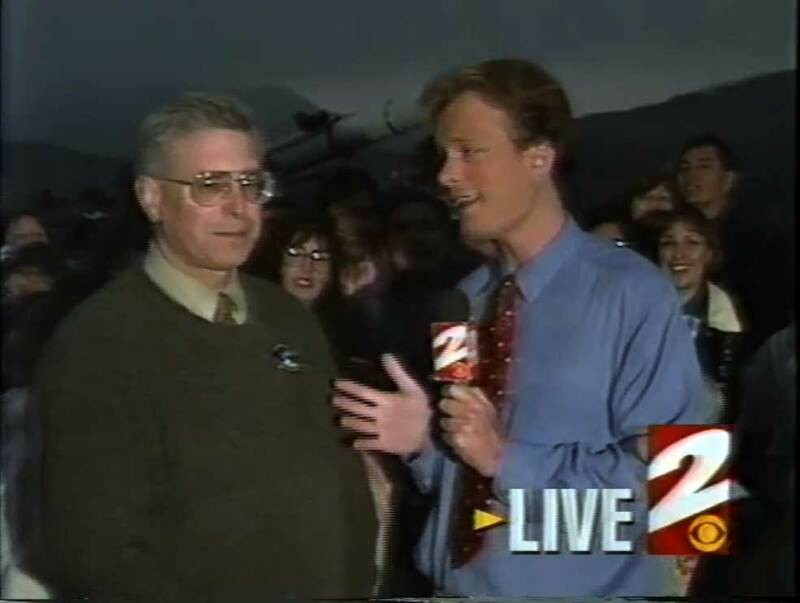 This local Eyewitness News interview is from the 1980s. Click for a 47-second excerpt (2.2 MB). This Christmas Star documentary was hosted by Roger Moore. It wasn't the first or last time that "Mosley" was spelled wrong. Click for a 71-second video extract (4 MB). Perhaps the most widely-distributed documentary on the Christmas Star, aka The Star of Bethlehem, was produced by York Films in 1993. Click for a 1-minute 42-second summary of John's take on the star – and the date of Herod's death (5 MB). John has appeared on CNN Headline News several times. Here he gives the reaction of astronomers (and rational people everywhere) to claims of UFO landings and alien abductions. They give you about 12 seconds for a sound-byte and they don't do retakes, so it helps to have your thoughts in order and to be concise. Click for a 24-second extract (1.3 MB). 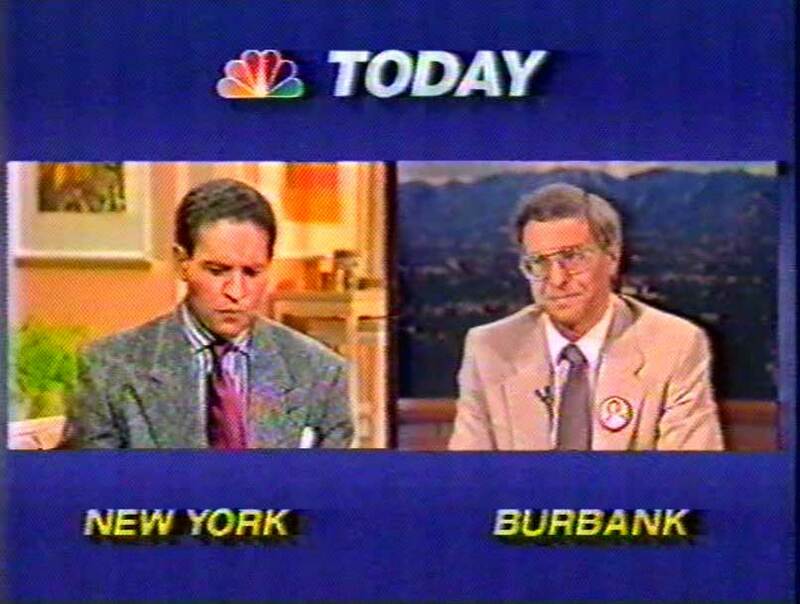 Bryant Gumbel interviewed John on the Today show on May 6, 1988. It had just come out that President Reagan consulted an astrologer to advise in setting his schedule of events (! 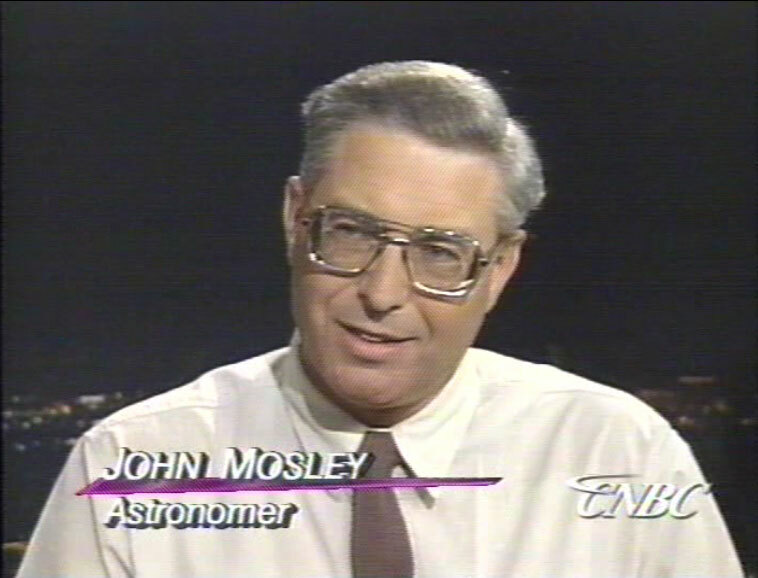 ), and John was asked what astronomers thought of that. The button John wore was a picture of the astrologer Nostradamus with a slash through it. It was 4:30 a.m. on the West Coast and John was (and appeared) groggy. Click for 3 segments stitched together that total 2 minutes in length (8 MB). 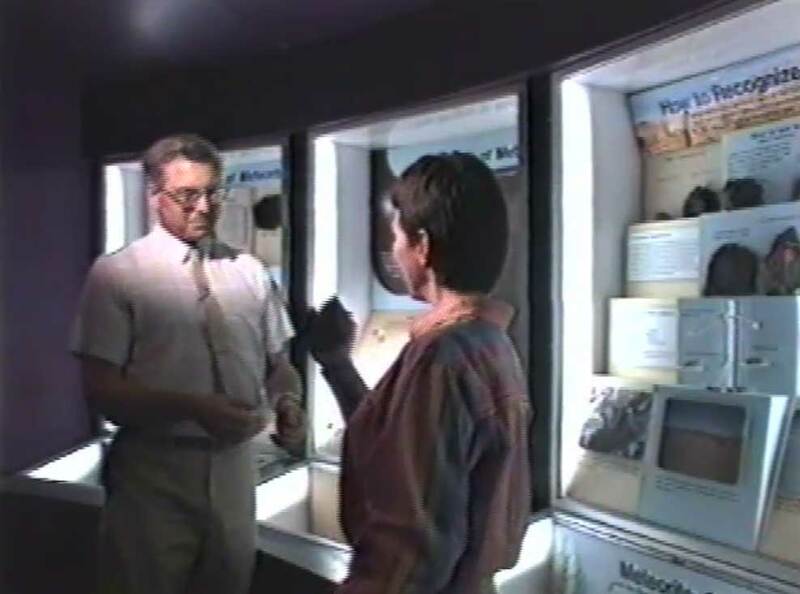 Huel Howser visited John to learn about Mars. He's a wonderful interviewer and it was a great deal of fun to work with him. His enthusiasm is genuine. Click for a 2-minute 35-second excerpt (18 MB). 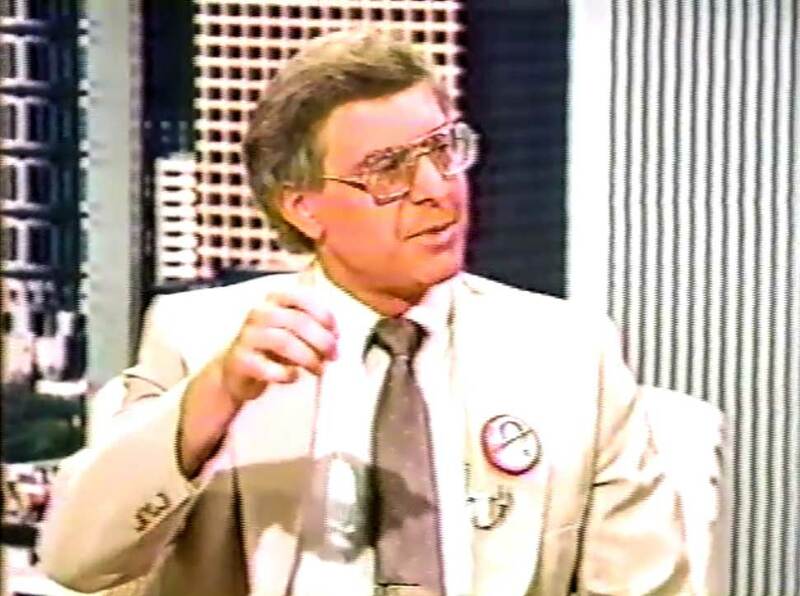 Tom Snyder had been on the air forever when John appeared on his national show in May, 1994, to talk about an upcoming solar eclipse. 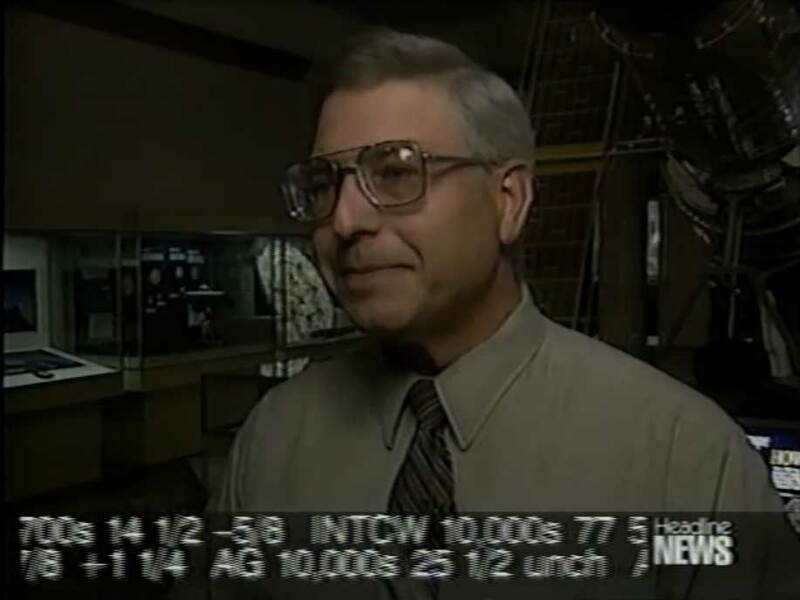 Click for a 4-minute extract of the half-hour appearance where John explains how to view the partial eclipse safely (14 MB). Comet Hyakutake appeared on short notice early in 1996, and it was a great comet when seen from a dark location. 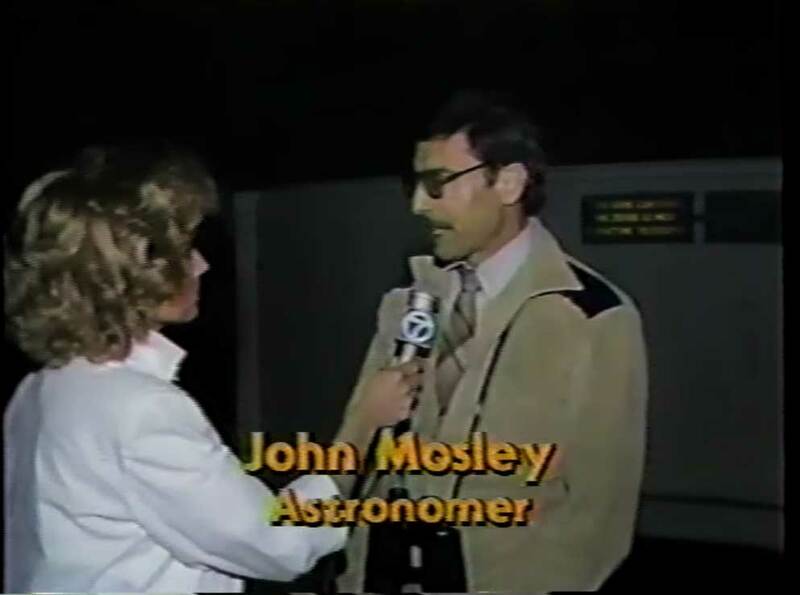 John appeared on TV many times to explain how and where to see it. Click for a 2-minute live interview (5 MB). Remember Comet Hale-Bopp? It delighted skygazers for weeks in 1997, and it was so bright it could be seen from within major cities. John told a lot of people where to look and what to look for. Click for a 56-second live interview (3 MB). 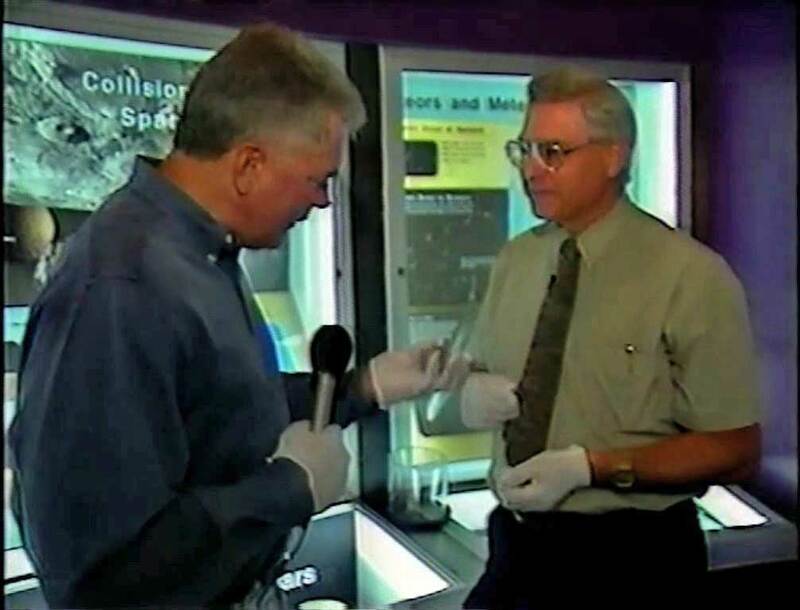 British astronaut Helen Sharman asked John to explain where meteorites come from for a BBC special on science for junior-high-school kids. Click for a 47-second extract (4 MB). John appeared on Stephanie Edwards' morning talk show and told her and her astrologer guest precisely what he thought about astrology. His "No Nostradamus" button got a lot of air time. Click for a 28-second excerpt (3 MB). 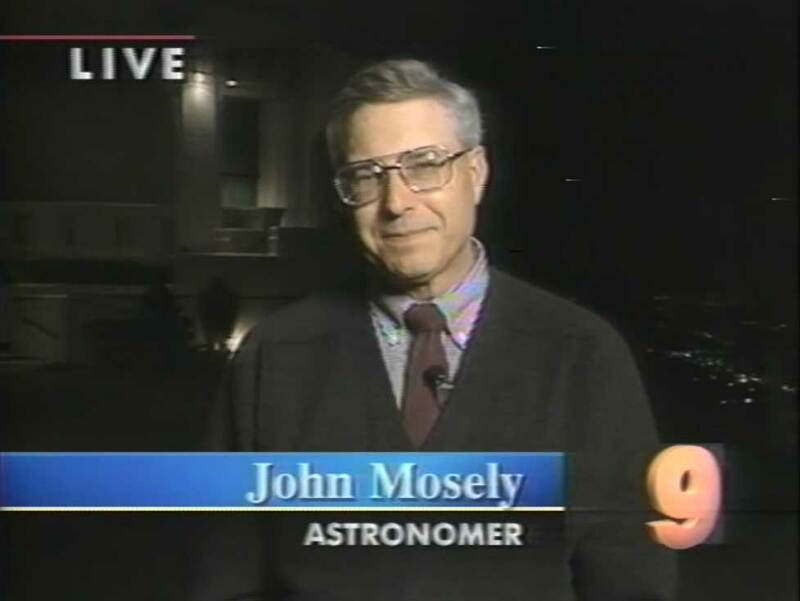 John appeared on Good Day L.A. (Fox News) to talk about Sky Awareness Week in 1996. Of course, for John every week is Sky Awareness Week. Click for a 2-minute 24-second extract (8 MB). John's most recent appearance was for a History Channel documentary on the Star of Bethlehem, filmed in his backyard in October 2013 and broadcast in March 2014. Click for a short extract (2.2 MB). This page does not include John's numerous appearances in newspapers (beginning in 1963) and magazines (including People and Parade), radio interviews, or public lectures.